Five leading Australian chefs take uson an expert tour of the best street food haunts in five renowned food cities. Free from the pretence and obsession with status that permeate so many restaurants, street food is so often the best food. It is, after all, a more authentic, honest and pure form of cooking that most truly reflects the culture of the destination. Wandering street food hubs in parts of the world, notably those which proliferate in south-east Asia, is an event in itself with the sights, the smells and the energy emanating from local people plying their trade. And what's more, it's ridiculously cheap, being invariably a fraction of the cost of what you'd pay for the same dish in a restaurant. "There are elements in street food that you can't acquire when playing it safe, and you truly can't experience the country's culture when you limit yourself," says Luke Nguyen, the Australian-Vietnamese celebrity chef, who more or less introduced street food into the living rooms and kitchens of Australians through his popular SBS televsion series. For some travellers, understandable concerns over hygiene will often mean street food will never top everyone's menu overseas. But while it pays to exercise a certain degree of common sense, always playing it safe is to miss out on some of the best cuisine you'll ever try. In this special Traveller guide, a quintet of Australia's leading and most well-journeyed chefs – including the streetwise Nguyen and Ben Milbourne – impart their knowledge and enthusiasm of street food in key destinations across Asia. 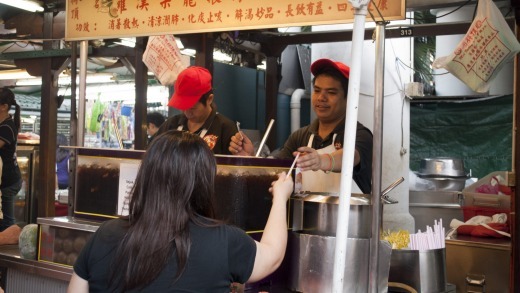 Here's their advice on where to go and what to look for when it comes to kerbside cuisine. WHY "Street food is the best way to experience the vibe of the city, a direct conduit into its heart and soul – it's action-packed, friendly and inviting and the choice is astounding," Manfield says. 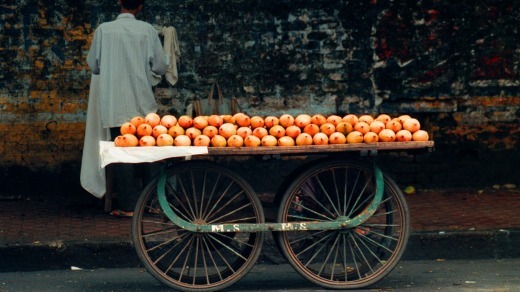 Mumbai is a city of dreams and opportunity, best expressed through its vibrant food culture. I stick with places that are frequented by locals, observe, ask questions and be brave." HIT THE STREETS Some of Manfield's most treasured Mumbai stamping grounds include the Colaba and Fort districts as well as the Kala Ghoda district where she will frequently stop off at one of the street vendors along Khao Galli, a popular eat street. "Look out for kheecha [seasoned rice flour flatbread cooked over hot coals] and vada pav [bread rolls with spicy potato filling], the city's version of a burger, only better," she says. Dadar Station is another of Manfield's favoured hotspots, where at the lassiwalla right by the front entrance you'll find "the best lassi in town". In north Mumbai, she often heads to Bandra West to wander along Bazar Road market before stopping for chaat​ snacks at Elco, a pani puri centre with a menu of delicious vegetarian chaat snacks or at Pal's Fish Corner for "incredible fish tikka". In a city where street food, obsession-wise, is second only to cricket and perhaps a real religion like Hinduism, selecting what to eat can be almost as tricky as where to eat it. Manfield suggests everyone, "try all the chaat snacks like bhel puri, a delicious mix of puffed rice, potato, chilli and tamarind chutney served on a small disposable (and biodegradable) leaf plate". "Pani puri are hollow puffs filled with spiced potato, chickpeas and filled with mint or tamarind water, dahi puri are flat crisp puri wafers doused with yoghurt, tangy tamarind and coriander and sev puri is a plate of flat puri disks smothered with mint and coriander chutney, a red chilli chutney, potato, onion, tomato, lime juice and sprinkled with crunchy sev." STAYING WELL "Drink bottled water, eat food that is cooked in front of you," Manfield says. "Trust your own gut instinct." WHY "I would prefer to eat Thai street food cooked by Thais than Thai street food cooked by – and I say this with a smack of irony – a foreigner cooking in a hotel," Thompson says. HIT THE STREETS '"Bangkok is a city of villages," Thompson says. "If I have an appointment across town, I almost plan my trip across the city according to where I'm going to eat. It allows me to visit places I wouldn't normally go to." And when it comes to the top street food haunts in Bangkok, Thompson insists, "great food areas do cluster, but there's a galaxy of clusters". While Suckhumvit 38 in the prestigious Thong Lo district is perhaps the most famous among Westerners, it's soon scheduled to close down but Thompson reckons you'll find far more authentic street food in and around Chinatown. "The Thais live to eat and they're quite cantankerous and complaining if it isn't right," he says. "My dictum would be wherever there's tourists, the food will be of a lesser quality. "Thais are only human and so if there's a certain anonymity to their customer base, then they're not going to be as scrupulous as they might be providing food to their own friends and family or regular customers. The best thing you can do is latch on to a Thai and just tag along for the ride." Thompson's go-to street food dish in Bangkok is an oyster omelette, known locally as "hoy tod" and he rates a tiny, third-generation shop house, Nai Mong Hoi Nang Tort at 539 Thanon Phlapplaachai, off Charoen Krung Road as the best place in the city to sample this classic dish (for visitors, look for the two mirrors on the wall and the dark smoky pan sticking out onto the street). "It's just fantastic, it's the quintessential Thai street food dish or rather it illustrates why Thai street food can be so good, it's made up of a crisp and rich base of eggs topped with an unctuous sauce of oysters and spring onions. Sprinkle it with some white pepper and splash over the siracha chilli sauce and you'll understand why the place has been going for 40 years." STAYING WELL "Be aware," Thompson says. "You can tell when a stall is well run and hygienic, you get a sense from the diligence with which they are preparing their dishes." WHY "Street food constantly introduces me to new ingredients, teaches me wonderful stories and allows me to meet the most incredible local people who allow you to delve deeper and understand their true way of life," Nguyen says. HIT THE STREETS Street food is ubiquitous in Saigon but Nguyen insists Co Giang Street Food and Wet Market in District One are among his favourites. "You should get there by 6am to get the full authentic experience," he says. 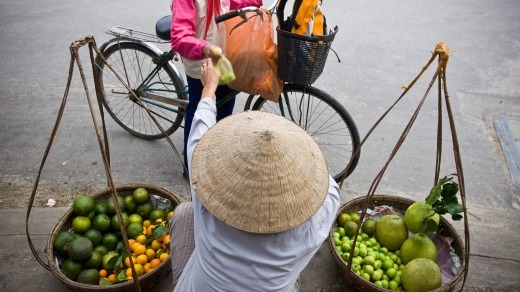 "Vietnamese are early risers, so locals come out to buy the freshest produce to cook their daily meals, or to slurp on a quick bowl of noodles for breakfast before work." "Go-to" breakfast dishes include bun thit nuong (char-grilled pork skewers with vermicelli noodles and fresh herbs), banh mi cha ca (a baguette filled with fish cakes), or chao long (a rice congee with offal). If you oversleep, the same strip comes alive again at 5.30pm, serving classic dinner dishes such as banh xeo (crisp rice flour crepe with mung beans and prawn and pork) and bo la lot (char-grilled betel leaves with beef, wrapped in rice paper). When it comes to great street food Nguyen says it's all about keeping it in the family. "You need to find the vendors who have been around for 20-30 years – their stall passed on from generation to generation," he says. "They should specialise in just one dish, so you know they do it well. The ingredients are all laid out in front of you, so you can see how fresh it is, then they prepare and cook it up before your very eyes." 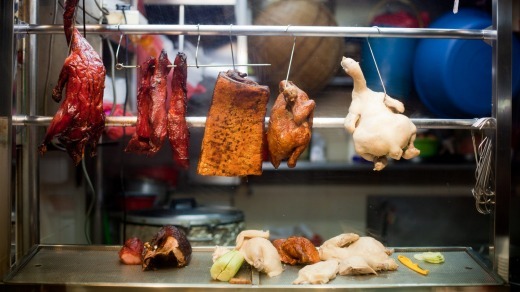 Nguyen's other essential Saigon street food dishes include char-grilled chicken wings, ducks feet, ducks tongue, wok-tossed salt and chilli crab, pork baguette roll, pan-seared rice cakes with egg and soy as well as duck embryo cooked in tamarind, or simply boiled. "Saigon street food should also be fun, a place where you can spend time with your friends and enjoy great food with beer," he says. "Or, if you're on your own, then you can just sit, eat, drink and be intrigued by the hustle and bustle of Saigon." STAYING WELL "Be careful on going too hard too soon with ingredients you're not used to," Nguyen says. WHY "Missing out on the tastiest food around leads to heartbreak and regret, conditions which have no cure," Evans says. HIT THE STREETS Evan's philosophy is simple when it comes to hunting down great street food in Shanghai. "Stay away from the big, fancy Western places," he says. 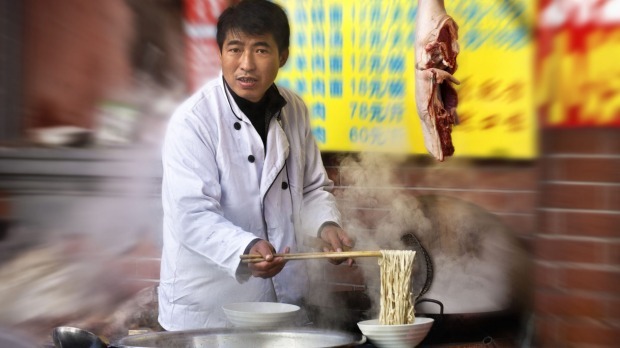 "You've come to Shanghai, so eat like the locals and tuck into every noodle and steamed bun you can get your hands on. "Look for a small shop around breakfast or lunchtime and check for the queue, if it's long, wait and hope, these guys know their good from the bad." In a country where English is not widely spoken, he suggests doing some research before setting out in search of street food and having some dishes in mind, "a few polite requests from your hotel concierge will point you in the right direction". Essential dishes to try include xiao long bao, "soup dumplings that are incredible when done well. Evans says that "they are messy, slightly dangerous and really bloody good, and tick many boxes. Go for hairy crabs if they are in season, also the steamed bread buns filled with sweet pork are exceptional". Evans rates Yang's fry dumplings in the Jing'an neighbourhood as the top spot for the former while Lost Heaven in the Xuhui district "specialises in great southern Yunnanese food" while another spot for "really great technique" is Art Salon, where you'll find "great fresh flavour and very well cooked produce". STAYING WELL "Dive in and hope for the best," Evans says. "Smell pays a big part – if it smells like a toilet, jog on." 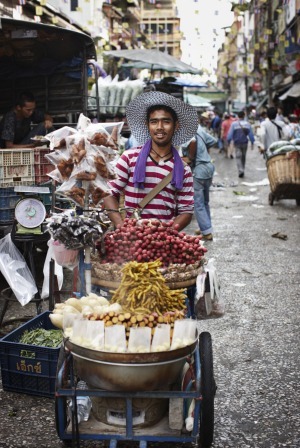 WHY "In all my travelling experience the street food has been the best food," Milbourne says. "It's where the locals eat. 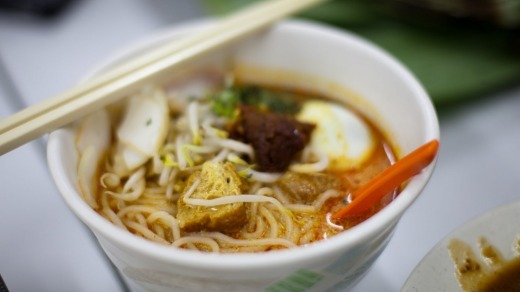 The best way to experience a rich heritage is through food, and there's no shortage of it in Singapore." HIT THE STREETS "Singaporeans are known for their food promiscuity" Milbourne says. "They're thinking about the next good meal while they are eating their current meal. I found myself doing this while I was eating my way around Singapore." Milbourne especially rates Changi Village Food Centre. "It's truly a local food paradise, with a stall or two selling virtually every kind of Singaporean dish. One stall, one or two dishes, and that's it. They do one thing and they do it superbly. The best thing about this place is that it's near the airport so if you have a long stopover you can easily visit and get a quick Singaporean food fix. 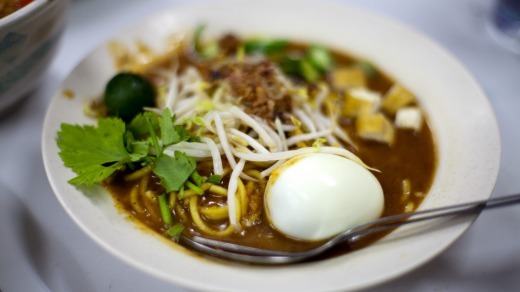 If you only have one day in Singapore, this is the place you want to eat at." Milbourne also says he loves to look around the food stalls at the outer MRT stops. "Each stall has their specialty and they are all busy with locals – that's when you know they're cooking good food. Everyone's got their favourite chicken rice place, and they bicker about who serves the best version, almost like we bicker about the footy," he says. "It's impossible to have bad chicken rice in Singapore." Other beloved dishes include roti prata, a delicious savoury pancake with South Indian origins, served in many varieties. "New versions are springing up all over the island. There's the plain egg – you can even order the egg scrambled into the flour or served sunny side up, known locally as plaster – onion, cheese, and even dessert versions like chocolate and ice-cream. It reminds me of crêpe, only more savoury, with a chewier, doughy texture." Finally, there's carrot cake, a dish often lost in translation. "Daikon is known locally as white carrot, which is preserved and mixed into the dish. The cake comes from the rice cake that's fried with egg. There's a black and a white version. Both are must-tries. 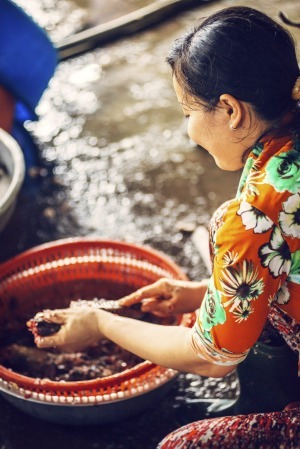 They are savoury, sweet, salty and sour, all the flavours you'd expect in Asia." STAYING WELL "Trust the stalls that are busy and have a high turnover – use your common sense," Milbourne says. "If there's lots of locals lining up for the food then it's got to be good." Australian-Vietnamese chef Nguyen opened Sydney's Red Lantern restaurant in 2002 and has since hosted a number of SBS food shows covering everywhere from south-east Asia to France. He shooting his new street food series in Ho Chi Minh City, Kuala Lumpur and Jakarta. See grainbyluke.com and redlantern.com.au. Author, chef, food writer and presenter, Manfield has a great love of street food and India in particular. Her new book A Personal Guide to India and Bhutan will be released this month. See christinemanfield.com. Thompson is known internationally for his passion and expertise in Thai cuisine. Having lived and worked in Bangkok for a number of years, Thompson's opened a several successful Thai restaurants around the world before going on to host SBS show Thai Street Food. His newest restaurant, Long Chim, will open in Perth's FJM Property's Old Treasury redevelopment this year. See comohotels.com. Having spent the first nine years of his career refining his skill set at Rockpool, in The Rocks area of Sydney, Evans later worked closely with stellar chef Neil Perry on the development of Spice Temple Sydney, assuming the role of head chef at the restaurant which opened early in 2009. Evans' love of Asian cuisine has led him to Shanghai regularly. See rockpool.com/spicetemplesydney. Since becoming a finalist in MasterChef season four, Milbourne has appeared regularly on national television and now hosts his own show, Ben's Menu, on Network Ten. He has toured Singapore as part of his culinary adventures and has released two cookbooks, Mexican Craving and Tasmanian Trail. See benmilbourne.com.au and bensmenu.com.au.